A rather odd, but I hope, entertaining draft poem for Grace’s prompt on With Real Toads to write about “pink.” Actually, one of my personal favorites of my poems is a sestina called Pink that may be found here. This is one of many poems and draft poems written each day this April 2015 National Poetry Month. PS – this has been edited since first posting. This entry was posted on April 25, 2015 at 9:51 pm and is filed under poetry, Uncategorized. You can subscribe via RSS 2.0 feed to this post's comments. This is so gentle and sweet. I love your bone china! This is really outstanding, K. Really lovely. 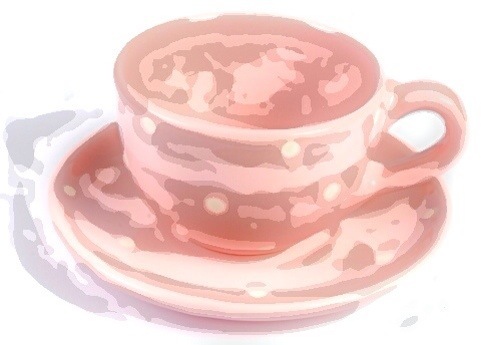 From a graceful beginning to a super-apt metaphor, to a bit of endearing down to earth gab between friends, this poem is like piano music to me, a perfectly modulated sequence which tells us everything we ought to already know about our pink teacups, chipped and fragile or sometimes misplaced, but ready to offer a sip when needed. Hope all is well with you, k.